SCVHistory.com | St. Francis Dam | Bill Hart and the Little Dam Victim. A lifeless lamb in a makeshift morgue brings Newhall's leading citizen to his knees. We have been researching Newhall history, particularly William S. Hart and his friendship with Wyatt Earp. We have been reading your articles and find them fascinating. Particularly, "Spooky Happenings at Ruiz Cemetery," which you wrote in 1996. We were curious about your quote, "Among the occupants is an unidentified boy whose broken body was dressed in a little cowboy outfit by a grief-stricken William S. Hart." We are confused and curious about how this affected William S. Hart and how he became involved with this little boy, and why he was dressing the little boy in the cowboy suit. Was it for the little boy's funeral? This is an incredible story and would love to know more. Thank you for asking. The notion of the unidentified boy at the Ruiz Cemetery has been taken as gospel for decades and repeated by writer after writer, myself included. But your inquiry prompted a bit of snooping, and as you'll see, the boy wasn't exactly unidentified — and he wasn't buried at the Ruiz Cemetery. The St. Francis Dam, perched high above Saugus, burst shortly before midnight on March 12, 1928. An estimated 450 people lay dead by the time the floodwaters reached the Pacific Ocean the next morning at 5:25 a.m.
Communities were battered, physically and emotionally. Only San Francisco, 22 years earlier, had lost more of its citizens in a single day, and if one were to tabulate the casualties as a percentage of the population, the St. Francis was surely worse. Survivors often had to travel from town to town along the floodpath, frantically searching the makeshift morgues for loved ones who had been swept away. By 4 a.m., volunteers were already starting to fill the Masonic lodge in Newhall, normally a happy and popular dance hall, with improvised slabs for the dead. Given the hour of the disaster, most victims were clad in night clothes or in nothing at all, their garments shredded and their bodies mangled by 12.5 billion gallons of angry water. Locating, much less identifying, all of the corpses took a great deal of time. Newhall's most prominent citizen, Bill Hart, grieved with the rest of the community. As he wrote to his friend Wyatt Earp, "Only those who were in it or near it can realize how tragic it all was. ... At one time there were 78 bodies in the little shack that had been converted into a morgue." One of Hart's own ranch hands had lost numerous family members and was now left, at age 16, to care for his younger siblings. For more than a week after the flood, no one had claimed the body of a blonde-haired, fair-skinned little boy, presumed to be about 3 years old, who lay on a slab in Newhall. "This 'cowboy' being Wm. S. Hart, more beloved than ever, if that could be possible, from this loving act," the writer continues. "The men and women who have gone through the gruesome task of the past weeks, dry-eyed, without a quiver, let overwhelming tears roll down their cheeks when they pulled the sheet from over the face of this baby asleep." That Hart had dressed the boy in a little cowboy outfit is an oft-repeated local legend that hasn't been refuted. Hart did make arrangements, sending the boy's body to the Nobles funeral parlor in San Fernando in preparation for interment on Sunday, March 25, at the Ruiz Cemetery in San Francisquito Canyon, where eight members of the prominent Ruiz family had been buried the Sunday before. Then, just before the day arrived, the boy was given a name. Unfortunately only the surname is remembered. Relatives or family friends reportedly identified him as the young son of S.C. Prixler (alternately Trexler) of Merced. It seems the Prixlers (or Trexlers) had picked the wrong time to pass through Newhall and were lodged at the McIntyre camp, an auto park with cottages, gas station and café for travelers at Castaic Junction — which, after the flood, resembled a barren beach. Mr. Hanna, the night cook, described the confusion at McIntyre's. "About 12 o'clock the lights went out," Hanna told then-Signal Editor A.B. Thatcher, "and in the few minutes of darkness we talked about the cause. Then the lights came on again." The lights kept going out, and in awhile, "we heard the roaring and saw flashes of light. We ran out into the road and saw the light from the fallen electric wires, but thought it was a train." As the noise grew louder, George McIntyre presumed it was emanating from the nearby Edison substation along today's Magic Mountain Parkway. "The roaring was now close at hand, and all at once it dawned on us that it was water," Hanna said. "Then we ran hard, and was (sic) able to keep out of the way. ... Had we gotten a clear idea of the danger, or thought or known of the dam (break), all persons in our place might have been saved." George McIntyre lost his father and brother. Guests simply vanished. The body of Mrs. Prixler (Trexler), the little boy's mother, was recovered, but Mr. Prixler's (Trexler's) wasn't, at least not within a fortnight after the tragedy. Further details are scarce. Neither Prixlers nor Trexlers appear in the 1929 registry of death settlements negotiated by the city of Los Angeles; perhaps no relative was close enough to file a claim. Indeed, even the identification of the little boy was considered dubious at the time. The March 29 Newhall Signal had reported that "relatives are said to have made the identification;" a week later the paper termed the identification "rather uncertain." Nonetheless the townsfolk altered their plans and redirected the boy's body to Oakwood Cemetery in Chatsworth, where he was buried March 29 alongside the woman believed to be his mother, Mrs. Prixler (Trexler). Newhall's prominent minister, Rev. Wolcott H. Evans, officiated. "(Evans), who had been engaged to conduct the funeral (at the Ruiz Cemetery) when it was expected that W.S. Hart would sponsor the burial, conducted the funeral (in Chatsworth), assisted by members of the Newhall Community Church choir," Thatcher wrote. "Interest in the little fellow resulted in a largely attended funeral, with numerous floral offerings." But nowhere in the crowd were there any relatives. "A few friends of the Trexler family were present, however, and it was on their rather uncertain identification that the bodies were buried." For his part, Evans provided nonstop solace for the community to the point where he took ill and had to be hospitalized a couple of weeks later, no doubt from exhaustion. "His principal need is rest," Thatcher wrote. He recovered. Meanwhile, the ceremony that had been planned for March 25 at the Ruiz Cemetery went on without the little boy. The procession was scheduled to depart from the Masonic hall at 2 p.m. and wind its way to San Francisquito Canyon. Hart and several other area cowboys, both "real" and "reel," among them Andy Jauregui, hauled with them a stone marker whose execution evidently was spearheaded by a deputy sheriff Bogardus and other community leaders. The marker still sits where Hart and company planted it. But Newhall's Masonic hall was never the same. Two weeks after the disaster the last body had been removed, "and grim marks of the awful scenes of the week were in evidence on the floor and walls," Thatcher wrote. "The floor was planed to remove the blood stains, and the walls tinted in a different shade to efface the memory of the gray days when bodies were everywhere. The plan (is) to turn the place back to the club in as good shape as when the awful tragedy made its use imperative." But all the cosmetic fixes in the world couldn't convince Newhall citizens to embrace the building again. Ultimately it was razed. In 1932 it was replaced by a two-story structure with a slightly different footprint that still stands at the northwest corner of Market Street and Railroad Avenue. 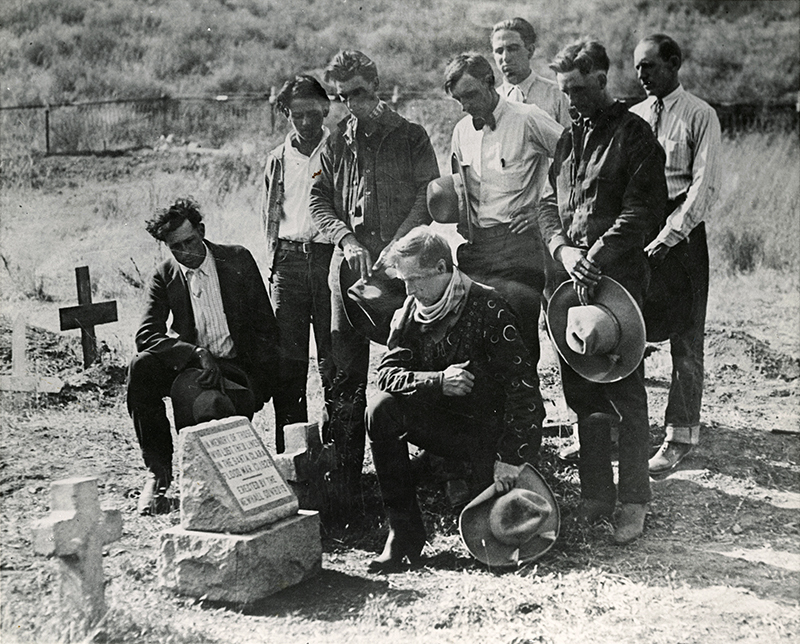 The Ruiz Cemetery is on private property and is strictly off-limits to the public, but you can see photos of the stone marker, and the Newhall Cowboys, and read more correspondence between Hart and Earp, on the Internet at scvhistory.com. The writer thanks dam historian Keith Buttelman for his assistance with this story. Direct your SCV history questions to info@scvhistory.com or talk to a docent at the Saugus Train Station Museum in downtown Newhall, Saturdays and Sundays from 1 p.m. to 4 p.m.
1. Estimate as of 2019: 411 people. 2. The reference to the name apparently occurs only twice in The Newhall Signal, both times written by Thatcher — once on March 29, 1928, as "Prixler," and once on April 5 as "Trexler." Logic dictates that the later occurrence stands a better chance of accuracy. Thatcher frequently misspelled names, even of prominent local citizens. ©2003 Leon Worden | Originally published in The Signal | All rights reserved.